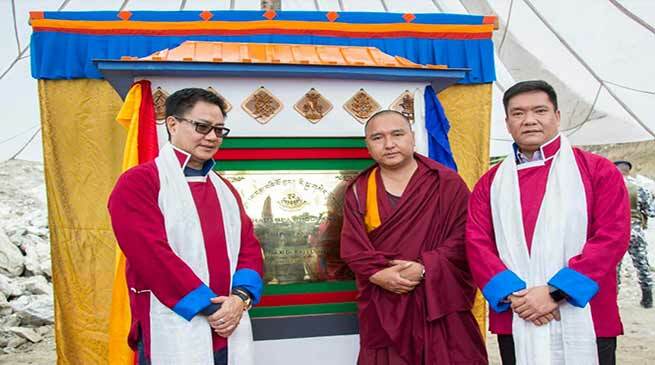 Arunachal Pradesh Chief Minister Pema Khandu today laid the foundation stone for Phadampa Phodrang here at Lhou village in presence of MoS Home AffairsKiren Rijiju, RWD Parliamentary Secretary Jambey Tashi, Tawang MLA Tsering Tashi and Dr Rikya Lhavoe Rinpoche. The Phodrang or the temple in Monpa dialect is dedicated to 10th century Buddhist Monk from South India -Phadampa Sangye- who had travelled to Tibet through Lhou village. Chief Minister in his speech said the temple will be constructed to mark the visit of Buddhist Saint Phadampa to Mon area and preserve his teachings. The temple will also house the statue of Saint Phadampa, a six feet gold coated copper statue prepared by Dr Rikya Rinpoche. MoS Home and Dr Rikya Rinpoche also spoke on the occasion. A book authored by Dr Rinpoche ‘Advice on repaying the kindness of parents’ was released by Rijiju. Later the Chief Minister and the dignitaries visited the rock where the Buddhist Saint has his knee imprinted on a rock. Earlier the Chief Minister inaugurated the steel bridge over Jangda stream and also laid the foundation stone of infrastructure development at Lhou.